Keep your glass stemware collection clean and safe with the Winco GHC-16 Chrome Plated Wire Glass Hanger, 16''. 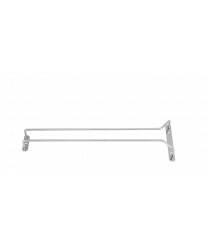 These glass hangers are easily installed on the underside of a cabinet or shelf. Your fragile stemware will remain tucked away, which prevents costly damage and frees up valuable bar space.